네덜란드의 디자인을 두루 일컫는 ‘더치 디자인(Dutch Design)’은 독창적이면서도 실용적인 특성을 바탕으로 세계적으로 널리 사랑받고 있습니다. 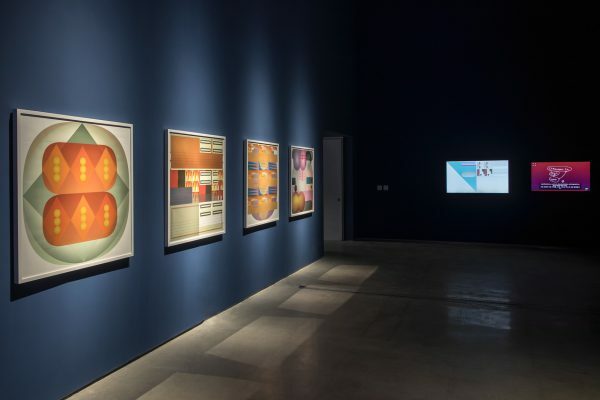 디자인에는 다양한 분야가 있지만 특히 ‘그래픽 디자인(Graphic Design)’은 더치 디자인의 대표적인 분야 중 하나라고 할 수 있는데요. 오늘은 Dutch Culture Korea 독자 여러분들이 더치 디자인을 조금 더 가까이 만날 수 있도록, 네덜란드 그래픽 디자이너와의 인터뷰를 준비했습니다. 한국에 온지 약 3개월 차, 현재 국립현대미술관(MMCA) 창동 레지던시에 입주하여 여러 작업을 펼쳐가고 있는 네덜란드 그래픽 디자이너 ‘팀 써즈데이(Team Thursday)’가 그 주인공입니다. 네덜란드의 문화예술재단인 ‘Mondriaan Fund’와 ‘Creative Industries Fund’의 지원을 통해 매년 두 명의 네덜란드 (혹은 네덜란드에서 주로 활동하는) 아티스트가 한국을 찾습니다. 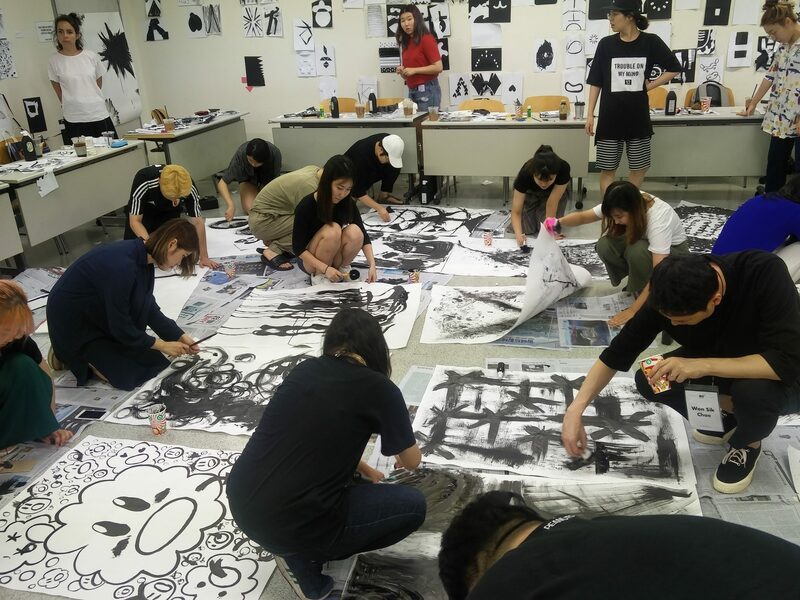 2015년 시작된 몬드리안재단 펠로우쉽 프로그램(Mondriaan Fund Fellowship Program)으로, 매년 순수 예술가와 디자이너가 한 명씩 MMCA 창동 레지던시에 입주하는 것인데요. 올 5월 11일부터 8월 30일까지는 Team Thursday의 ‘시모너 트륌(Simone Trum)’이 레지던시에 입주해 작업하고 있습니다. 또한 7월 초부터는 Team Thursday 듀오의 또다른 디자이너인 ‘루스 판 에스(Loes van Esch)’도 합류해서 ‘완전체’ Team Thursday로 여러가지 작업을 이어가고 있습니다. 이들의 홈페이지를 방문해보면 ‘T_T’ 모양의 아이덴티티가 눈에 띄는데요. 눈물을 흘리는 모습을 표현한 한글 이모티콘 중에 하나인 ‘ㅜㅜ’와도 닮아있어 재밌습니다. 또, 걸그룹 트와이스의 노래인 ‘TT’가 떠오르기도 하는데요. Q: 안녕하세요, Dutch Culture Korea 블로그 독자들에게 본인 소개를 부탁드립니다. A: 우리는 ‘Team Thursday’의 루스 판 에스(Loes van Esch), 시모너 트륌(Simone Trum)입니다. 네덜란드 로테르담에서 온 그래픽 디자인 듀오이죠. 지금은 서울의 MMCA 창동 레지던시에서 4개월 동안 지내고 있어요. Q: 왜 팀의 이름을 ‘Team Thursday’라고 정했는지 궁금한데요. A: 우리는 아른헴(Arnhem)의 아르테즈 예술대학교(ArtEZ)에서 함께 공부했는데요. 하지만 그 당시에는 함께 일하지 않았어요. 이탈리아의 우르비노(Urbino)에서 여름 학교를 보내는 동안, 우연히 함께 프로젝트를 할 기회가 있었는데 이 프로젝트가 꽤 잘 진행되었어요. 그래서 조금 더 함께 일하면서 어디로 나아갈지를 지켜보기로 했어요. 1년 동안 일주일에 하루를 같이 일하기 시작했고, 그 날이 ‘목요일(Thursday)’었습니다. 그러고나서 우리만의 스튜디오를 시작하기로 했을 때 ‘팀(team)’이라는 단어가 잘 어울린다고 생각했어요. 우리가 일하는 방법을 활기차게 설명해주는 것 같았거든요. 우리는 꽤 활동적이고, 작업물이나 갖고 있는 생각들을 함께 교환하며 작업하거든요. Q: 그렇다면, 왜 한국으로 오게 되었나요? 특별히 한국이었던 이유가 있나요? A: 처음으로 우리가 서울을 방문했던 건 2015년이었는데요. 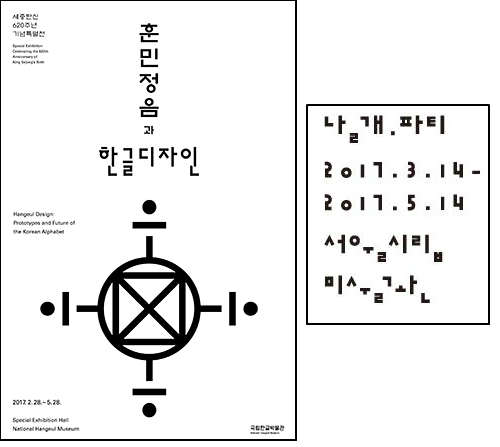 ‘타이포 잔치; 타이포그라피 비엔날레(Typojanchi Typography Biennale)’에 프로젝트를 전시하기 위해서였어요. 이 때 엄청난 그래픽 디자인, 많은 볼거리들이 있었고 너무나도 좋은 경험이었어요. 단지 비엔날레만으로는 충분하지 않다고 생각했죠. 한국의 꽤 젊으면서도 흥미로운 (그래픽) 디자인 문화가 흥미로워요. 우리는 네덜란드에서 학생들을 가르치기도 하는데, 학생들 중에 한국인들이 꽤 많이 있어요. 그래서 이번에는 반대로 우리가 한국에 가면 좋겠다고 생각했어요. 한국에서 어떤 것들을 마주치게 될지 보고싶었죠. 또한, 큰 문화적 차이가 재미있고 즐거워요. 네덜란드에서는 볼 수 없는 것들을 보면서 끊임없이 놀라고 있어요. Q: 여태까지 했던 프로젝트들 중에서 가장 흥미로웠던 프로젝트를 소개해줄 수 있나요? A: 음, 질문의 시기에 따라서 답이 크게 달라질 것 같은데요. 다양한 프로젝트들이 다 각자만의 다양한 이유로 흥미로웠다고 생각해요. 만약 한 가지만 정해야한다면, 지금으로서는 ‘Moving Futures Festival’ 프로젝트일 것 같아요. 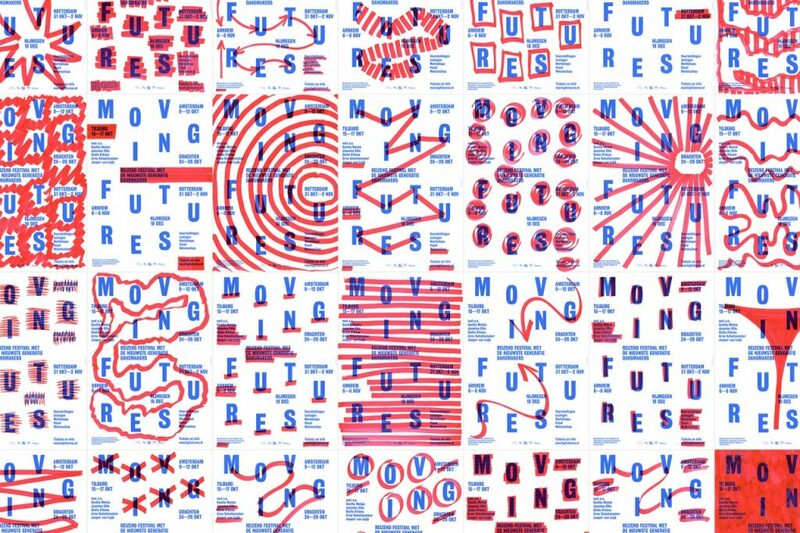 ‘Moving Futures Festival’은 네덜란드의 순회하는 현대무용 페스티벌인데요. 화제가 되는 안무가들이 많이 출연해요. 이 과제를 작업할 때, ‘그래픽 디자이너로서 어떻게 춤을 출 수 있을지’를 스스로에게 질문했어요. 우선 페스티벌과 관련된 모든 텍스트들을 담은 포스터 템플릿을 만들었고, 수작업으로 2000개의 포스터를 한 단계 끌어올렸어요. 빨간색 마커로 특정한 정보들을 강조한 건데요. 한 주 동안 오래된 댄스 스튜디오에만 머물며 포스터 위에 그리는 작업을 했어요. 매우 육체적인 행동이었죠. 암스테르담과 또다른 도시들을 돌아다니면서 다른 포스터들을 우연히 마주치는 것이 너무 좋았어요. 왜냐면 우리도 어느 포스터가 어디에 걸릴지 모르고 있었기 때문이에요. Q: ‘더치 디자인(Dutch Design)’으로부터 영향받은 부분이 있을까요? A: 음, 좋은 질문이에요. ‘더치 디자인(Dutch Design)’이 하나의 정형화된 특징을 가진 운동이라고 이야기하기에는 어려울 것 같은데요. 만약에, 우리가 좋아하는 마튼 바스(Maarten Baas) 같은 네덜란드 디자이너들을 본다면, 재료에 있어서 어떤 간단명료한 접근을 하는 것을 볼 수 있어요. 실용적이고도 현실적인 면이요. 이런 부분은 우리의 작업 속에서도 발견할 수 있어요. 우리는 우선 기본적인 재료, 또는 이미 존재하는 물건이지만 새롭게 재료로 재활용될 수 있는 것(found materials)을 잘 사용해요. 이 재료들은 그들 자체로 반드시 어떤 가치를 지니는 것은 아니지만, 이들을 응용함으로써 그 가치가 변화하죠. 서울에서는 일반적인 문구점과 을지로 상가들에서 재료들을 많이 모았어요. 우리 스튜디오의 플랫폼에 그 재료들을 놓아두었고 그것들을 이용해 많은 스케치들을 하고 있어요. Q: 더치 디자인과 한국 디자인의 차이점은 무엇이라고 생각하나요? 그리고 서로가 무엇을 배워갈 수 있을까요? A: 일반적으로, 네덜란드에서는 ‘그래픽 디자인’ 이전에 커뮤니케이션에 대해서 더 많이 이야기합니다. 이를 통해 디자인은 간결해지고, 때로는 더 제한적이게 되기도 하는데, 이로써 결과물은 더 ‘안전지대’에 놓이게 됩니다. 이런 과정은 디자인에 있어서 혁신이나 재미를 유발하지는 않는다고 생각해요. 우리가 서울의 디자인으로부터 받은 감명은, 디자이너들이 원하는 것을 무엇이든 만들어낼 수 있는 자유가 있다는 점입니다. 사람들이 그래픽 디자인 자체나, 그 형태에 대해서 더 많은 관심을 가지고 있는 것 같아요. 영향력에 대해서는, 서로서로 영향을 주고 있는 것 같아요. 아마도 특히 더치 디자인이 한국에 영향을 주고 있는 것 같고요. 우리가 네덜란드에 돌아가면, 우리는 한국 디자이너들의 포스터들과 함께 전시를 하려고 해요. 디자인된 매체들을 실제로 보여주기 위해서요. Simone> 매우 다양한데요. 저는 많은 분야의 아티스트들의 작품들을 보는 것을 좋아해요. 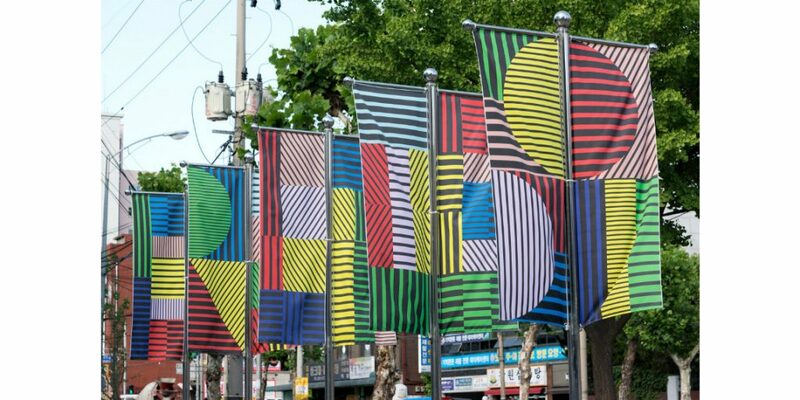 지금은 직물공예 아티스트인 안니 알버스(Anni Albers)에 대해서 읽고 있어요. 존경하는 아티스트들은 헬라 용어리우스(Hella Jongerius), 토바 아워벡(Tauba Auerbach), 세스 시글롭(Seth Siegelaub)이에요. 저는 디자인과 예술에 대해서 저의 남편인 쿤 타슬라르(Koen Taselaar)나 남매인 토마스 트륌(Thomas Trum) 등 제 주변 사람들과 이야기를 많이 나누는데요. 이런 대화들도 디자인을 작업하고, 생각하는 데에 있어 중요한 촉매 역할을 합니다. Loes> 네, 저 역시 경우에 따라서 다양한데요. 찰스(Charles)와 레이 에메스(Ray Eames)의 작품들을 보고 읽는 것은 항상 즐거워요. 로스엔젤레스에서 에메스의 집을 방문했었는데요. 평이하면서도 따뜻한 분위기가 아름다웠어요. 또한 그들이 여행하면서 모은 기념품들이 그들의 디자인 속에서 역할을 할 수 있도록 모아두었던 것 역시 아름다웠어요. Q: 한국에서 여가시간에는 주로 무엇을 하나요? 그래픽 아티스트니까 한국의 전시들에도 관심있었을 것 같은데요. 만약 한국에서 전시회를 가본적이 있다면 어떤 전시가 가장 인상 깊었나요? 또한 우리는 꽤 여러 전시도 방문했는데요. 이곳은 정말 많은 일들이 일어나고 있어요. 특히 한글 박물관이 꽤 인상 깊었어요. 방문했을 때는 동시대 디자이너들이 한글 글씨를 가지고 작업한 것들이 전시되고 있었는데 재밌었어요. (현재는 전시가 끝났어요.) 또, 서울시립미술관에서 있었던 안상수씨의 날개파티 전시도 좋았어요. 시청각(Audio Visual Pavilion)에서의 홍은주씨의 전시도 좋았고, 그 외에도 아주 많아요. Q: MMCA 창동 레지던시에 머무르는 동안, 그리고 한국을 여행하는 동안에 가장 주의를 사로잡은 것은 무엇인가요? A: 하하, 너무나 많은 것들이요 :) 어떤 특정한 무언가를 고르기가 어렵네요. 우리는 한국을 여행하는 동안에 많은 사진을 찍고, 서울을 많이 걸어다녔어요. 그리고 찍은 사진들을 카테고리화 해서 데이터 베이스를 만들었어요. 예를 들어서, ‘도시 카페트(city carpets)’ 라고 이름 붙인 카테고리에서는, 핸드폰 가게에서 손으로 만든 광고문들을 모았어요. 또는 창동에 있는 거의 모든 집에서 볼 수 있는 무늬가 있는 벽돌들과, 할머니들이 입으신 화려한 무늬 위의 또다른 무늬들. 아름다웠어요. 그리고 ‘사랑’ 카테고리가 있는데요. 우리가 한국을 돌아다니는 동안 마주친 많은 하트 모양 조각상들의 사진을 이 안에 모았어요. 이 조각들은 셀카를 찍을 때 배경의 역할을 하면서도 또한 경치를 꾸미는 역할을 하는 것 같아요. 네덜란드에서는 이런 것들을 발견하는 건 상상하기 힘들어요. 팀으로서, 우리는 커플들이 같은 옷을 입는 것도 매력적으로 보였는데요. (때로는 바지에서 찢어진 무늬까지 매우 정확하게 같은 커플들도 있었고, 다른 블라우스지만 같은 천으로 만들어진 옷을 입고있는 커플도 있었어요.) 하지만 이런 것들은 사진으로 담아내기에는 조금 어려움이 있죠. Q: 최근 홍대에서 워크샵을 진행했는데요. 어땠나요? 워크샵에 대해 이야기 해줄 수 있나요? A: 우리는 ‘Character Club’ 워크샵을 진행했어요. 우리가 아른헴(Arnhem) ArtEZ 에서 학생들을 가르칠 때 사용하는 방법이죠. 모든 학생들이 하나의 글자를 선택하고, 일련의 짧은 과제들을 통해서 그 글자를 다양한 아날로그적인 방법으로 탐험하고 만들어내게 됩니다. 학생들은 추후에 디자인으로 발달될 수 있는 글자들의 데이터베이스를 만들어요. 우리는 이 학생그룹과 함께 리소그래픽 프린팅 방식으로 출판물을 만들었어요. 이 모든게 이틀만에 이루어졌답니다. 모든 학생들이 열심히 해주었어요! 그들의 집중력에 감명받았어요. Q: 그럼 워크샵 후, 요즘은 주로 무엇을 하고 있나요? MMCA 레지던시 기간도 마무리가 되어 가는데, 어떤 작업을 할 예정인가요? Q: Could you please introduce yourself to the readers of our blog “Dutch Culture Korea”? 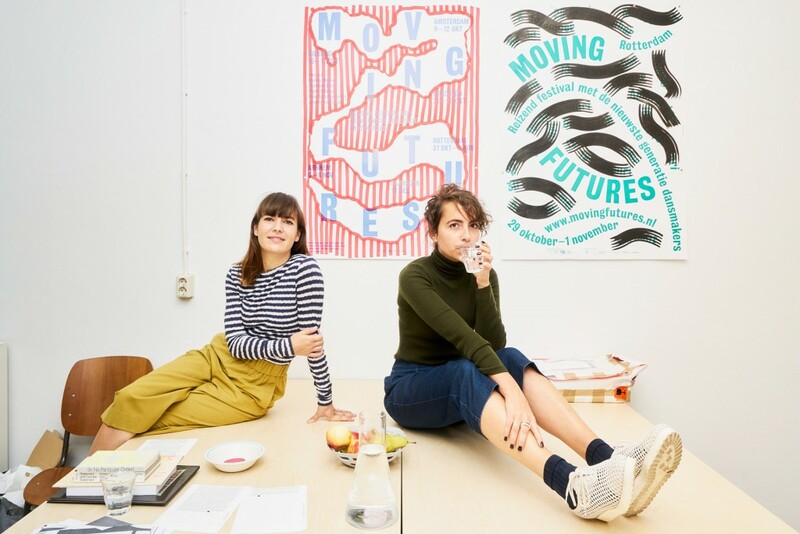 A: We are Team Thursday – Loes van Esch and Simone Trum, a graphic design duo from Rotterdam, The Netherlands. 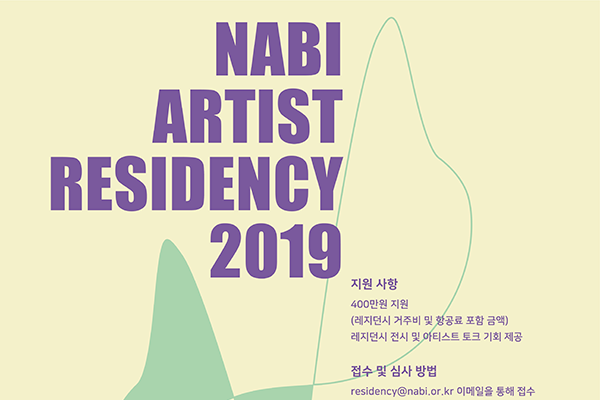 Currently on a 4 month residency at the MMCA Museum in Seoul. Q: How did you come to name your design studio ‘Team Thursday’? A: Well – we studied together at ArtEZ Arnhem, but at that moment it didn’t accure to us we could work well together. During a Summer School in Urbino, Italy we coincidentally worked on a project together. This went quite well, so we decided to try to work together more, see where that would go. We started for one year working one day per week, on a Thursday. Then, when we wanted to start our studio, we thought the word ‘team’ is quite an appropriate, energetic description for the way we work. That is, quite active and exchanging files and thoughts all the time. Q: What brought you to Korea? Why specifically Korea? A: The first time we visited Seoul in 2015 because we were exhibiting a project during the Typojanchi Typography Biennial. This was a great experience, a bath of graphic design, many things to see. We simply didn’t get enough of it! Through the Stimuleringsfonds we could go again on the residency and I think we still don’t want to leave :). 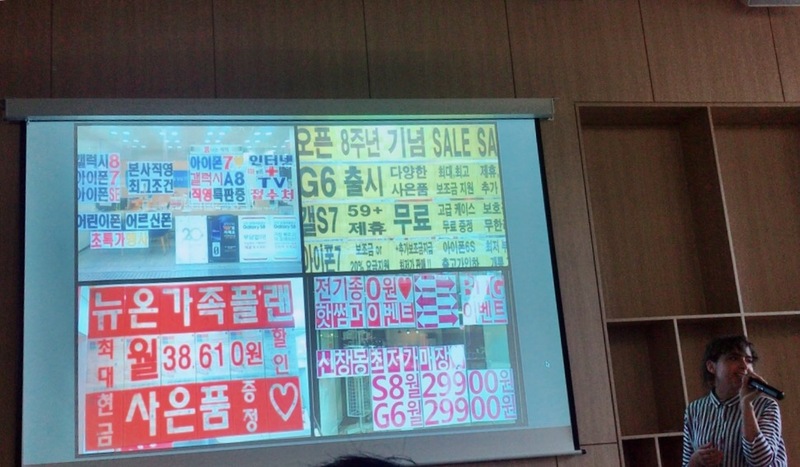 Korea is for us interesting because of the fairly young but very interesting (graphic) design culture. We teach in The Netherlands and many of our students are Korean, so we thought it would be great to go the other way and see what we encounter there. Next to that, the big culture difference is great/pleasant for us, because we are constantly surprised by things we see that we couldn’t see in The Netherlands. Q: Which project among yours do you find most interesting? A: This answer would differ a lot, depending on the time of the question… We find many projects interesting for many different reasons. 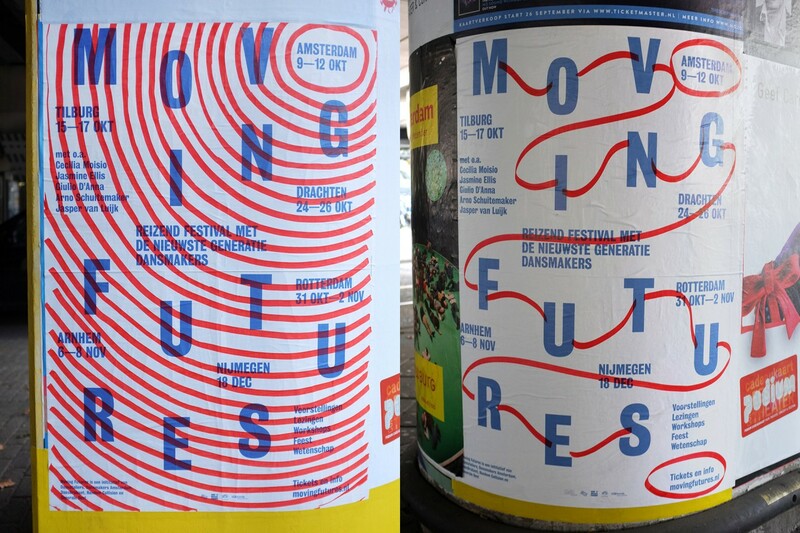 But if we have to name one, at this moment it would be ‘Moving Futures Festival’. It’s a traveling contemporary dance festival featuring emerging choreographers in The Netherlands. When we worked on the assignment we asked ourselves how we could dance as a graphic designer. We made template posters with all of the festival text on them, and manually enhanced all 2000 posters by hand, with a red marker, highlighting specific information. For one whole week, we were locked in an old dance studio to draw on the posters, which was also a very physical act. It was very nice to walk through Amsterdam and other cities later and encounter the different posters – since we didn’t know which poster would show up where. Q: In which part do you think you were influenced by Dutch Design? A: Mm good question. We find it a bit hard to talk about ‘Dutch Design’ as one movement with super specified characteristics. 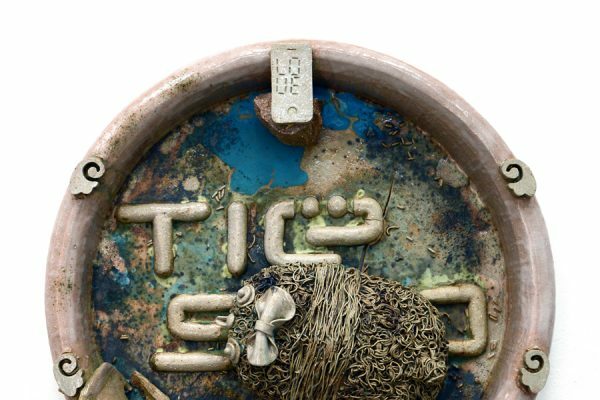 If we look at Dutch designers whose work we like, like Maarten Baas, we see a certain no-nonsense approach when it comes to material, some kind of down-to-earthiness. We recognize this in our work: we like to use basic materials, or found materials, that don’t necessarily have a value themselves, but applicating them their value changes. Here in Seoul, we collected many materials just from basic stationary shops and the Euljiro stores. They are laying on a platform in our studio and we make a lot of sketches with this. Q: What do you think is the difference between Dutch Design and Korean Design? And what can they learn from each other? 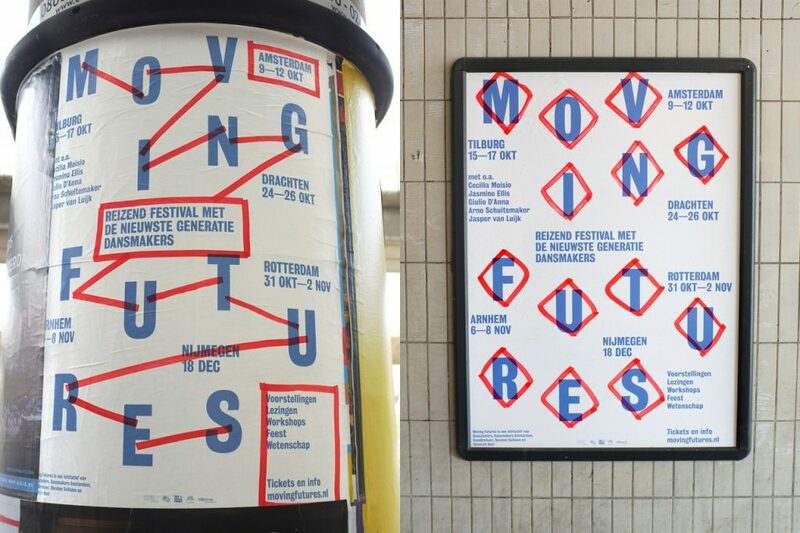 A: In general, in The Netherlands there is more talk about communication before graphic design. This makes the design brief sometimes more restricted and the outcome more on the ‘safe side’. This doesn’t stimulate innovation or playfulness in design. Our impression is that the designer in Seoul gets a bit more freedom to make whatever he or she wants, it seems like there’s more attention on the graphic design itself, on the form. I think there’s also a counter cross influence, maybe especially a Dutch design influence in Korea. 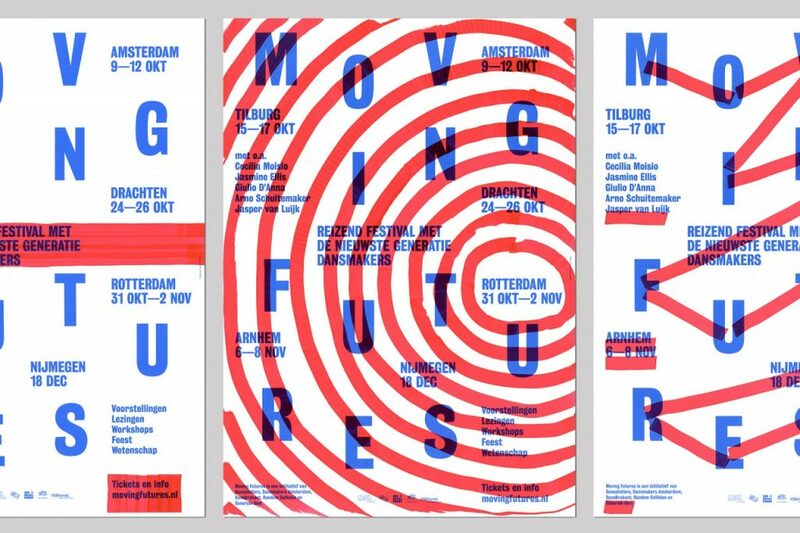 When we are back in The Netherlands, we will make an exhibition with posters by Korean designers, to show actual physical designed mediums. Simone> This varies a lot. I like to look at the work of artists from many disciplines. At the moment I’m reading about Anni Albers, a great textile artist. 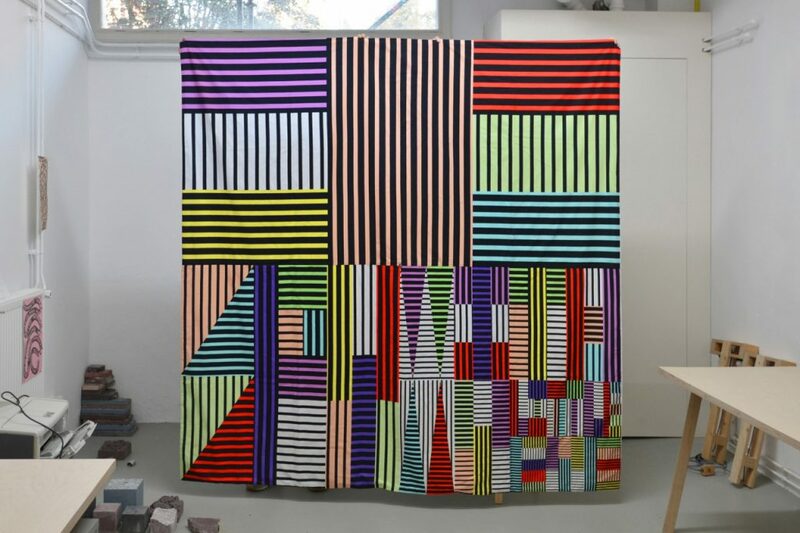 Ongoing artists I admire are Hella Jongerius, Tauba Auerbach, Seth Siegelaub. I talk a lot about design and art with people around me, like my husband Koen Taselaar and brother Thomas Trum. Those conversations are also a great catalyst for making and thinking about design. Loes> Yes, indeed this varies case by case. It’s always a pleasure to look and read about the work of Charles and Ray Eames; a while back we visited the Eames house in Los Angeles and it was beautiful in its simplicity and warm atmosphere but also in the way they collected souvenirs from their travels and let them play a role in their designs. Q: What do you usually do in your free time in Korea? You are graphic artists, so I think you must have been interested in exhibitions in Korea. 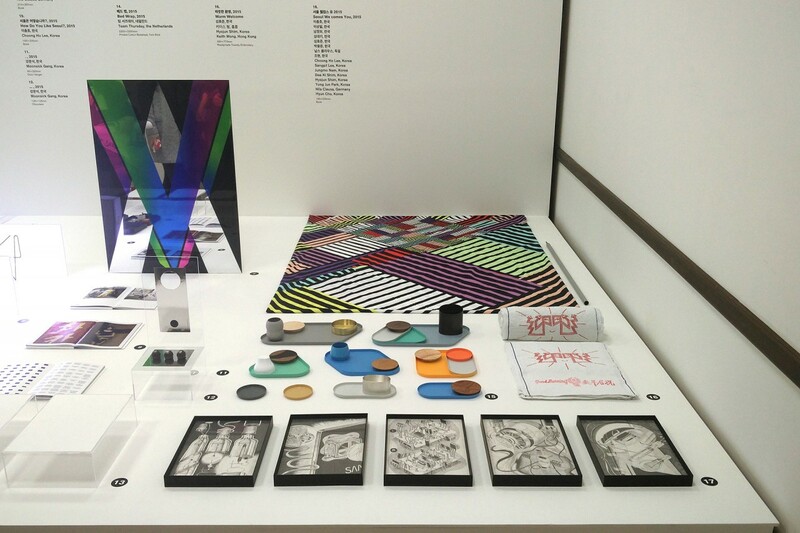 Have you visited any exhibitions in Korea, and if so, which one did you find impressive? A: Since the residency is ending at the end of the month and the heat is quite overwhelming, we currently spend a lot of time at the studio. However, Dutchies as we are, we bought bikes and take some time almost every day to cycle around the riverside. This is a great time for making up our mind and seeing some of the environment (and being warned by old Korean bikers that we can’t cycle next to one another). Q: What caught your attention most while staying in MMCA changdong residency and travelling in Korea? A: Ha, so many things. It’s hard to choose one specific thing. We took many photo’s while traveling in Korea and walked around a lot in Seoul. Out of those photo’s we made a database with categorized photo’s. For instance, the category ‘city carpets’, that’s what we call all handmade signage in the phone shops. Or all the bricks with patterns on almost every house in Changdong, and the old ladies who wear pattern on pattern on patterned clothes, beautiful. 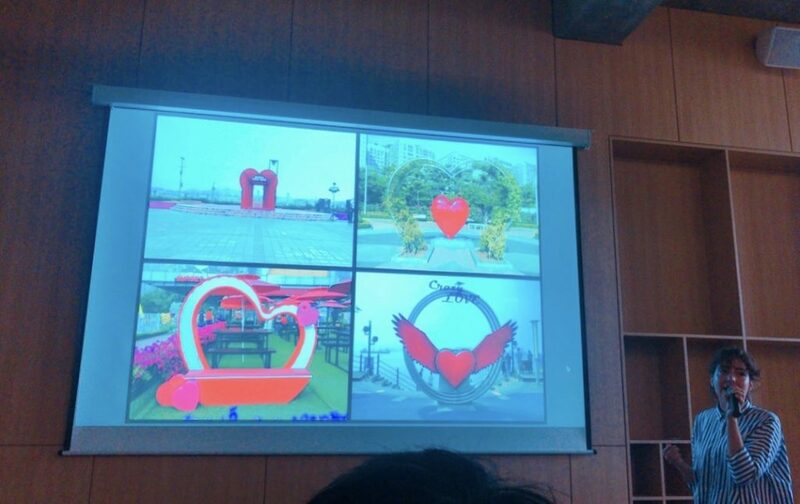 And the ‘love’ category, where we collected a lot of love sculptures that we ran into all over Korea. I think they serve as a selfie backdrop and landscape decoration. In The Netherlands it’s unthinkable to find something like this. Being a team we’re also fascinated by all the couples who wear the same clothes (sometimes very precise, we ran into a couple that had the same tears in their trousers, and a couple who wore two very different blouse models but in the same fabric). But those are a bit harder to catch on photo. Q: You recently did a workshop at Hongik University. How did it go and could you tell us more about the workshop? A: We gave a Character Club workshop – a method we use at our teaching position at ArtEZ Arnhem. 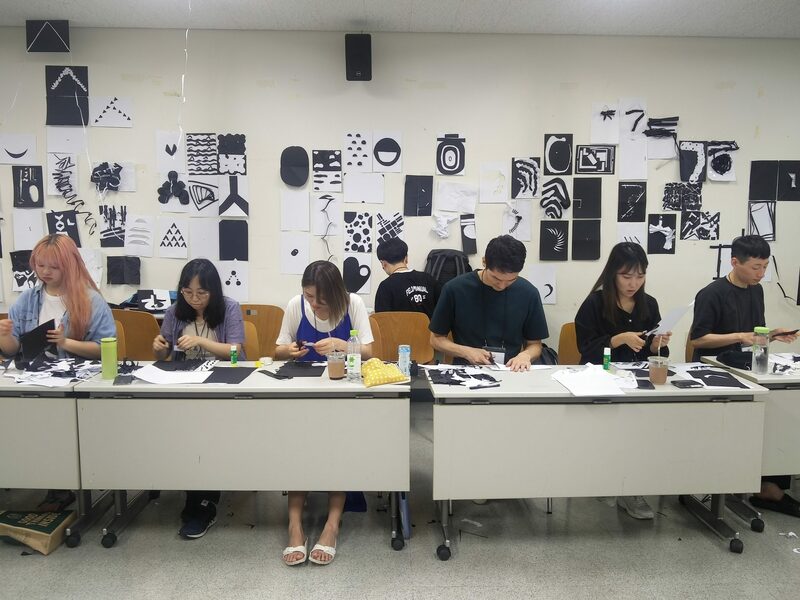 All students choose 1 letter which they will explore and make in various analogue techniques through a series of short assignments. They make a database of letters that could be developed further into a design or letterset. Together with the group we made a risoprinted publication out of it. And this all in 2 days – the students worked quite hard! We are impressed by their concentration. Q: Then after the workshop, what are you mostly busy with nowadays? What will you be doing during the last moment in MMCA residency? 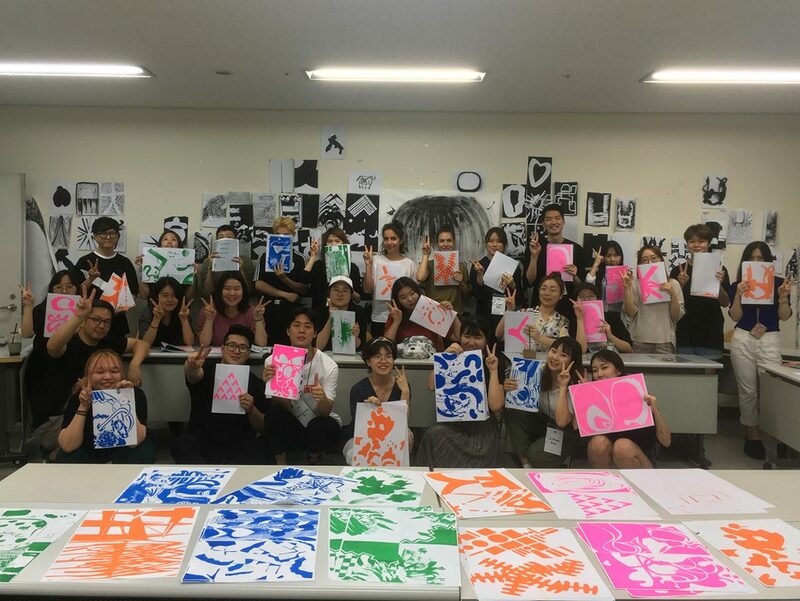 A: We’re working on a small exhibition here at the MMCA Changdong, with the work we made during our residency – finished work but probably also sketches. Next to that, we’re working on two assignments: a big steel sculpture that will be placed in Ilsan Park and a 12 meters high mural for the Changdong Youth Centre, collaborating with Shin Architects. It will take some time to finish everything, so we will probably work on it almost until we leave. Next to it we meet up with friends for soju, and we really want to climb Bukhansan on one of our last days :). Van Gogh “Sunflowers(해바라기)” 시리즈를 한 자리에서 만나다.